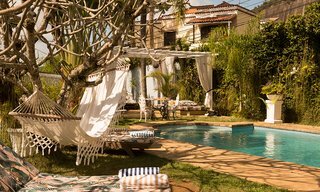 Though it’s certainly off the beaten path compared to Copacabana and Ipanema, the neighborhood of Santa Teresa — once quaint and bohemian, now rapidly becoming the bairro of choice for chic travelers — isn’t exactly a secret anymore. But a few quiet street corners, clattering streetcars and tree-shaded hideaways still preserve some of Santa Teresa’s romantic magic. Mama Ruisa, a seven-room boutique hotel housed in an old-fashioned mansion, is one of these time capsules. The elegant century-old house has old bones that are evident throughout, from the soaring ceilings and generously sized guest rooms to a curving wooden staircase and an airy front porch that’s just screaming out for you to kick back on a rocking chair with a book and a glass of lemonade. As wholesome as that sounds, Mama Ruisa doesn’t feel like a rambling country estate: the place has an urban edge, too, carefully cultivated by its French-Brazilian owner. The mansion’s original decorations have been stripped down, the oil paintings replaced with drawings by Jean Cocteau, the ornate lacquered furniture replaced by simple wooden coffee tables, canopied beds kicked out in favor of a minimalist look with crisp white linens and boldly printed fabrics. The more timeless elements of the original design — like the hardwood floors and floor-to-ceiling doors opening onto private balconies — remain in the themed suites, each of which takes inspiration from a Francophile hero (or heroine) like Josephine Baker or Colette. The grand, impossibly sleek living room — open to the ocean breeze, of course, by way of ceiling-high French doors — is almost as good-looking as the mansion’s lush swimming pool, shaded by a fringe of palm trees. The million-dollar view, though, is from Mama Ruisa’s main terrace. Thanks to the hotel’s hilltop position, guests can take in the sweeping vista over the Guanabara bay — and consider the masses crowding the beaches below — while feasting on tropical fruits for breakfast and feeling generally superior.